We’re celebrating San Francisco’s sailing traditions throughout the month of September as the City hosts the 34th America’s Cup. As a part of Anchor Brewers & Distillers’ planned activities, Anchor Steam® Beer has been named the official beer and Junípero® Gin has been named the official gin to San Francisco’s hometown team, ORACLE TEAM USA. 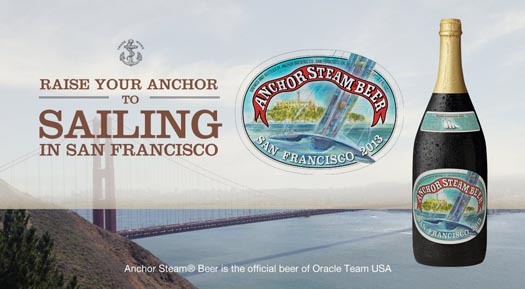 In addition to serving Anchor Steam Beer and Junípero Gin at a variety of ORACLE TEAM USA Events, all of San Francisco is invited to “Raise Your Anchor” at select bars, restaurants, beer and spirits stores, and at the historic Anchor Brewing Taproom. Capturing sailing on the San Francisco Bay and the history of Yacht America, we are offering a commemorative magnum of Anchor Steam Beer featuring a special label illustrated by long-time friend Jim Stitt, who has been handcrafting Anchor labels for 38 years. This unique offering is ideal for celebrations, and is also a one-of-a-kind collectible for both Anchor Steam Beer and San Francisco Sailing Fans. Purchase your commemorative magnum of Anchor Steam Beer at the Anchor Taproom, or at one of the participating Raise Your Anchor retailers listed below. As a member of SFMade, Anchor Brewers & Distillers partnered with fellow SFMade artist Marlon Beaver to design a limited edition t-shirt. Depicting the icons of the City, Marlon’s drawings and interpretative designs are San Francisco Originals. With aquamarine ink silkscreened on a navy v-neck t-shirt, Marlon’s design sails amongst skylines, yachts and trophies all anchored on the Bay. 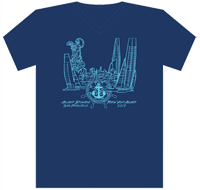 The artisan-designed shirt will be available for sale in the Anchor Taproom and at SteamGear.com. Anchor Brewers & Distillers is also highlighting the Official Beer Cocktail of ORACLE TEAM USA, The Anchor’s Cup. Developed in collaboration with Russell Davis, 2012 Nightclub & Bar Bartender of the Year, this beer cocktail creates a new sailing cocktail ritual, inverting a shot mixture of Junípero Gin and The Kings Ginger Liqueur into Anchor Steam Beer with a splash of fresh orange juice. The Anchor’s Cup is best enjoyed sipped with an Anchor Steam Beer back. Join us for an Anchor’s Cup at one of the Raise Your Anchor bars and restaurants listed below, or pick up the ingredients and mix up your own using the recipe below, and Raise Your Anchor to sailing in San Francisco! San Francisco 201 Bayshore Blvd. San Francisco 3455 Geary Blvd.